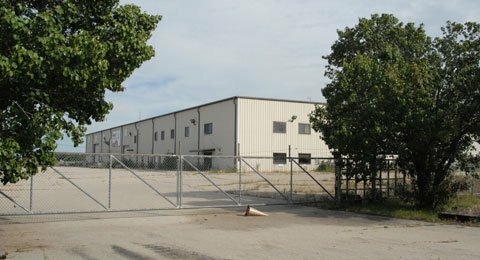 Other than a few work trucks and a large portable generator, things don’t look much different outside the former KanBuild building, which has been vacant since the Osage City housing manufacturing plant closed in 2011. But with Topeka company Asset LifeCyle LLC purchasing the building last fall, things are beginning to look different inside. Gearing up to open the business equipment recycling facility in just a few weeks, Asset LifeCycle owners Shawn VanFossen and Beverly Drew said Monday the next step is to fill the plant with employees. And that should be great news for some of the applicants who showed up last week at the plant for a company sponsored job fair. Applications are now being processed, Drew said, but potential employees are vetted with a background check, due in part to the security required for the equipment the company handles. VanFossen and Drew are as eager as the new employees to get the plant in operation. With the reclamation “disassembly” line almost in working order, it’s time to fill the plant with machine operators, material handlers, forklift drivers, sorters, general laborers, maintenance workers, truck drivers and a plant manager. While electricians worked Tuesday connecting power to run the devices, Drew and VanFossen offered a tour of the disassembly line, with the understanding that no proprietary information would be revealed. VanFossen noted that even the layout of machines in the plant was designed in-house by the company. “The Machine”, as it has been called locally since word of the new plant started circulating last fall, consists of a series of large conveyors connected to crunching, chopping or shredding machines. After electronics or other metal office equipment (anything from a curling iron to equipment as large as refrigerators, VanFossen says) go through the crunching, chopping or shredding, various other machines or people sort the materials (primarily metals and plastics) into appropriate bins. The entire contraption almost fills the west half of the former house manufacturing plant. One missing piece in opening the plant is a machine that will complete the disassembly line. “It’s still on a boat somewhere,” VanFossen said, with Drew saying that machine was shipped from Germany. But the puzzle piece will arrive, and Drew said she expected the plant to be open within six weeks. For that to happen, The Machine must be ready to operate, and employees must have had three weeks of training. She and VanFossen agreed the plant opening had a good chance of keeping on schedule. Drew said they expected at least 15 key jobs to be filled within three weeks, and up to 30 total positions hired by the time the plant opens. Estimates of the plant’s potential employment of up to 200 employees have been bandied about, but Drew and VanFossen said that is more a company goal than a calculated number. They explained that the recycling and reclamation world is continuously in a state of change, with new technologies and new services constantly being developed. VanFossen said new technologies and growth of the industry are what brought the 10-year-old company to the point of expansion, and brought them to Osage City. And with newer technologies, and room to expand, the number of jobs that could eventually be housed in the Osage City building is still unknown. “This building has the capability to handle our growth and expansion,” VanFossen said. The two explained that the company’s primary business is assisting companies and government entities in asset recovery, disposal and reclamation. The company’s website lists the company’s host of services related to the security, storage and destruction of electronic media or data, and the reuse and remarketing of computer or other equipment. They said services offered by the business in Topeka have outgrown that facility, leading to their search for a location for a secondary plant. “We needed to pick an area that would allow us to grow,” VanFossen said. He said Osage City’s proximity to Topeka made it a good choice. “It’s a great location and a great facility,” Drew agreed. Another plus is Osage City’s access to the power grid, VanFossen said. “That plays a huge part in the future of this company,” he said. The plant will be one of the city’s biggest electrical users. Osage City granted the company its standard electrical incentive agreement, which provides rebates on electrical use based on the amount of money invested into the building and the number of jobs created. Drew said once the Osage City plant is open, the Topeka plant will be known as Asset LifeCycle Investment Recovery, and will handle such things as securing and destroying data and refurbishing and remarketing equipment. The Osage City plant will be Asset LifeCycle Material Reclamation. “The Topeka plant will feed this plant,” VanFossen said. The two didn’t wish to specify the amount of materials their plants will process daily, but revealed The Machine had the capacity to handle several semi-trailer loads of materials during a 10-hour shift. Osage City’s citizens don’t need to worry about the newly reconstructed Nichols Road, which passes the plant’s gate, not being used. East Osage City is set to become a little busier. Future plans for expansion at the new plant remain company secrets, but the two company owners agreed that Kansas, Topeka and Osage City could become key locations for recycling and reclamation businesses. Drew said that Kansas has suited their company due to its central location in the United States. The co-owners agree they are proud their company is “Kansas homegrown”. In the meantime, opening the new plant takes priority for the co-owners. Drew said about 350 job applications were distributed last week; about 250 were completed and turned in. She said she expected Secured Staffing, of Topeka, the company handling Asset LifeCycle’s employee recruitment, to receive more of the completed applications, but anyone interested in working for the company should apply. She said the company also lists openings on its website www.assetlc.com and currently has openings in Topeka. Things are looking a little different at Osage City these days – it looks like soon there will be a few more paychecks around town.